KX7 Concave set for Case-IH combines for Tough-Thresh conditions, used for Corn and Soybeans. At half the width of most traditional concaves, KX7 concaves allow for greater customization of threshing configurations to specific field and crop conditions. The smaller design also allows for easier installation. KX7 concaves have been proven effective in various crops and conditions around the world. Replaceable boxes in each assembly include unique angled bars that meet the crop head-on. This design not only results in a better thresh, but allows for increased air flow disruption that results in greater capacity for improved combine productivity. Fits Case-IH combines 7240, 8240, 9240. 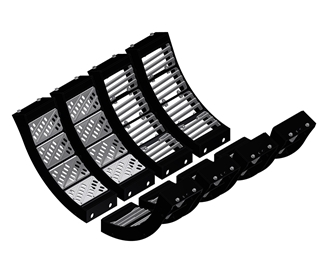 Set includes 8 concaves (4 LH of BA1-R22, 2 RH BA1-X14 for Rows 1 & 2, and 2 RH of BA1-R12 for rows 3 & 4). Made in the USA and shipped from the manufacturer.